Did you every want to go fishing and not need a fishing rod? In Indiana, America, on the wabash River you do not need a rod because the fish just jump into the boat thenselves. 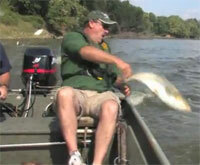 Flying silver carp jump and leap out of the water and into our boat. Indiana Outdoor Adventure TV hosts Troy McCormick and Mac Spainhour fend off the 20 pound fish as they attack the boaters and provide a boatload of fun and adventure. This is a very funny flyfishing video. If My Little Empire did flyfishing it would be this easy to catch fish.